A friend of mine (and amazing landscape/nature photographer) Jim Goldstein sent me a Tweet and pointed out simmering new conjecture in the art community that Vincent Van Gogh might have been color blind, specifically a protanope. I seem to remember some discussion of this years ago, particularly given that one can rather nicely simulate both protanopia and deuteranopia in Adobe Photoshop with built in filters (View>Proof Setup>Protanopia/Deuteranopia). However, the current speculation comes about from Kazunori Asada who wrote up a Tumbler blog entry here describing how he came about his idea and a subsequent app he wrote to simulate color vision and color blindness. 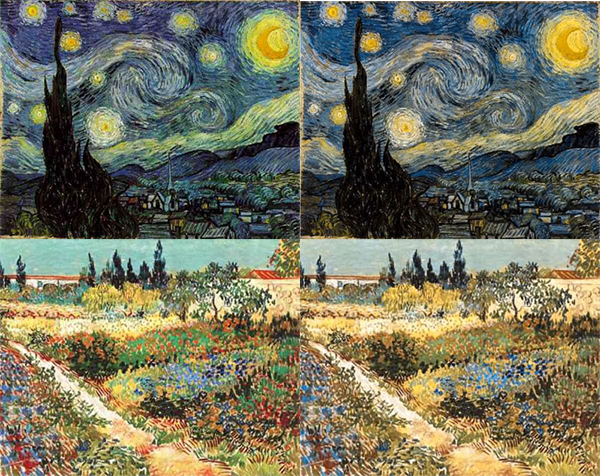 The image above shows Kazunori Asada’s approximation of Van Gogh’s Starry Night and Flowering Garden with Path with the original on the left and the Asada transform approximation on the right.